Gov. 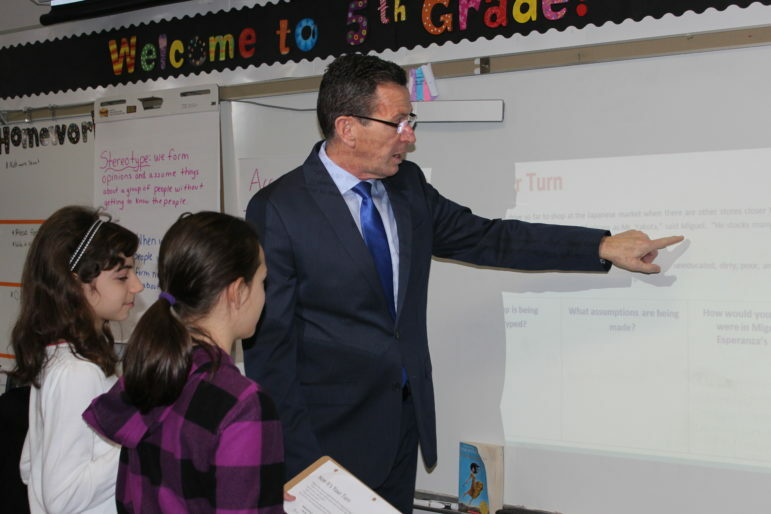 Malloy works with students on a lesson in a fifth grade class at a public school in Cromwell last year. Gov. Dannel P. Malloy and prominent legislators are beginning to brace the public for what they see as inevitable changes in how the state funds cities and towns as the state grapples with $1.4 billion in red ink for the next fiscal year. Malloy, a Democrat, has been reminding anyone who will listen that Connecticut covers the entire cost of municipal teachers’ pensions in both affluent and impoverished school districts, and those costs are escalating quickly. This has left many local leaders worried their overall state aid may be cut to help close the 8 percent deficit in the next state budget. The state spends more than $4 billion on elementary and secondary education each fiscal year. “Are we ensuring that all students, regardless of the life circumstances into which they are born, regardless of what town or city they live in, can receive a quality public education? I do not believe we are meeting that standard,” Malloy told legislators. So should the state’s most impoverished school districts, where the majority of students are multiple grades behind in reading and math, expect more money under the governor’s budget plan, or will they be shielded from cuts – an accomplishment itself given the state’s weak fiscal health? “They have to wait until the budget is finalized,” Malloy told reporters last week. Meanwhile, the Democratic leaders of the House and Senate have said the time has come to withhold state aid from small towns that refuse to become more efficient by regionalizing. They also want to give local leaders the ability to better manage their budgets, either by allowing them more ways to raise revenue locally or by scaling back restrictions on cutting education spending. State data show, however, that almost no districts or local officials are asking the State Department of Education for permission to cut school spending, and small districts don’t necessarily cost more to operate per student. 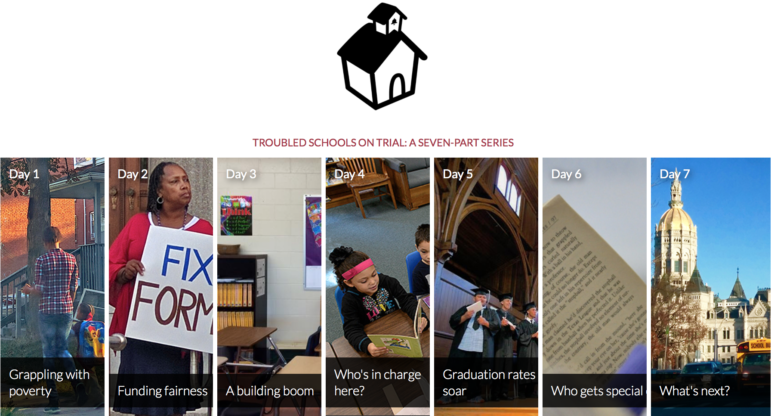 This debate is taking shape as the Connecticut Supreme Court plans to hear a state appeal of a recent Superior Court judge’s scathing indictment of how the state funds schools. The judge’s critique was at the core of his ruling in a lawsuit over whether Connecticut meets its obligation under the state constitution to provide an adequate public education for all. While Connecticut spends enough overall on education to meet state constitutional requirements, the judge ruled, the way it distributes the money, and some lax standards for educational performance, do not. “Potential new cuts in education aid underscore the need for judicial action to ensure that state government meets and does not retreat from its state constitutional responsibilities,” said Jim Finley, principal consultant for the group of municipal leaders and local educators suing the state, the Connecticut Coalition for Justice in Education Funding. Standing before the General Assembly earlier this month, Malloy highlighted the $360 million in increased pension payments for municipal teachers and state employees that the state is on the hook for in the fiscal year that begins July 1. “It’s clear we have more work to do to make our short- and long-term obligations more affordable,” Malloy told his somber audience during his seventh State of the State address, an event that generally sets the tone for the upcoming legislative session. Eighty-three percent of those increased pension costs represent ballooning payments the state must make for retired school teachers and other local educators. The remaining increase is for state employees’ pensions. Payments for both pension systems are escalating quickly because state and local officials promised benefits for decades without setting aside anywhere near enough funding to pay for them. More than a billion dollars each year goes to pensions for close to 36,000 retired public school teachers – a fast-rising, locked-in chunk of state spending. It has increased by an average of $80 million annually since 2005, and represents half of the $1.6 billion increase in Connecticut’s annual education spending over the past decade. Of the increased pension costs for the upcoming fiscal year, $33 million will go to pay for pension benefits in the state’s 20 wealthiest municipalities – one out of every eight new dollars in spending. The Malloy administration recently prepared a town-by-town breakdown of state funding for teacher pensions to assess how the current setup benefits taxpayers in each city and town. The administration released the analysis upon request by The Mirror. That data showed that for Greenwich – the most affluent municipality in Connecticut – the state will spend $24 million this fiscal year to pick up teacher pension costs. Greenwich has 8,800 public school students. For New Britain, which enrolls 1,200 more students and is one of the state’s poorest districts – the state will spend $17 million this year for teacher pensions – 33 percent less than for Greenwich. In Bridgeport, another impoverished municipality, the state will spend $30 million this year for teachers pensions – just 20 percent more than in Greenwich although Bridgeport enrolls two and a half times as many students. Unlike most other state education aid, the state contribution to teacher pensions does not factor in a town’s wealth or local taxpayer’s ability to pick up some of the cost. Rather, teachers pay a portion of their salaries into the fund (typically 6 percent), and the state and investment earnings cover the remainder of the costs. This approach benefits better-off communities since they are able to hire more staff and pay their teachers more. State data show that Greenwich has some of the best student-to-teacher ratios in the state and staff are paid well above state averages. The governor’s budget director wrote an opinion piece Sunday in the Hartford Courant to draw public attention to just how much help the state is providing “an affluent suburb” – in addition to the state’s Education Cost Sharing grant, which helps municipalities pay school operating expenses and factors in a municipality’s wealth. “Connecticut will send more than $3.4 million to Trumbull in education cost sharing dollars, and an additional $12.8 million to pay for the pensions of Trumbull’s teachers. The pension costs are born by the state even though . . . how much teachers are paid (and therefore how much their pensions cost) is entirely a local decision,” budget director Benjamin Barnes wrote. Malloy has shielded municipal aid from budget cuts, and modestly expanded local aid, throughout most of his six years in office. When the governor has recommended or imposed cuts he has overwhelmingly targeted better-off towns while somewhat shielding struggling districts. And the governor said during several recent public appearances that if local aid cannot be spared entirely, politicians need not only to prioritize, but also to weigh all forms of assistance to municipalities, and not just the well-known statutory grants. 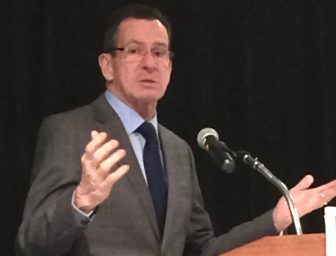 Getting even less public attention than teacher pension contributions, Malloy said, is the roughly $700 million the state borrows each year for local school construction projects. His administration has said it intends to seek changes to the law for that aid, as well. And to make its point that municipalities had a better financial cushion than the state, the administration also released town-by-town figures for their emergency reserves. Westport, for example, has $25 million for emergencies, which is enough to cover 12 percent of its operating budget. Towns typically need 5 percent of their budgets in reserve in order to protect their credit rating when selling municipal bonds. But everything over 5 percent could be used as operating funds, a spokesman for the governor’s budget office said when releasing the data. Overall, 45 municipalities have reserves that amount to more than 15 percent of their annual expenditures, reports the Office of Policy and Management – most of them better-off towns. By comparison, the state’s rainy day fund currently has $230 million, 1.3 percent of the state’s General Fund budget. Legislative leaders have some ideas of their own for saving money. The most cited idea involves forcing small school districts to regionalize and become more efficient. We can’t assume that we are going to continue shelling out money to towns who are all going to maintain all those independent, small school districts. The time has come, I think, for the consolidation of small school districts. House Speaker Joe Aresimowicz, D-Berlin, during a separate interview, also pointed to the need to regionalize and to penalize districts that resist. There are currently 43 school districts in Connecticut that enroll fewer than 1,000 students, but almost all of them already have regionalized their middle or high schools or both, and 22 districts have only a part-time superintendent. And further regionalization may not save much in many cases. Research released by the State Department of Education in 2013 showed that the majority of high-spending small school districts in the state did not spend more because they were small but because they were among the state’s most affluent and wanted to. Regionalization also is often unpopular among town residents who hold tightly to local control and are hard to convince that regionalization will result in savings. The last attempt to regionalize involved merging two elementary schools in Norfolk and Colebrook that were a 10-minute drive apart and enrolled 100 and 82 students respectively. Though enrollment was also projected to decline by 16 percent over the next 10 years, the merger was rejected by voters. “They felt their precious school would be ruined,” said Jeanne R. Jones, the chairwoman of the Colebrook school board who led the merger effort . Jonathan Costa, the assistant executive director of EdAdvance, which assists districts considering regionalizing, says combining is much easier when the school population is growing and towns are seeking state aid to build new schools. Looney, the Democratic Senate leader, wants to give towns the ability to replace any lost state revenue by raising the sales tax locally and keeping the proceeds. Malloy spreads his message to members of the Council of Small Towns last week. “That might offset the amount they are loosing,” he told reporters. Malloy, asked on several occasion about allowing towns to raise and keep some sales tax revenue, has been noncommittal. On the spending side, municipal leaders regularly say the state needs to allow school districts to generate savings by relaxing its requirement that districts spend at least as much on education as they did the previous year. That requirement, however, does not apply to the state’s highest performing districts. Towns also can cut spending between 1.5 and 3 percent from year-to-year if town enrollment declines, a school closes or a district can document savings to the education department. For all the rhetoric, only two districts have asked for permission to cut spending in recent years, said Kathy Demsey, the state education department’s chief financial officer. “Despite what people said, districts and communities were not banging down the doors asking for a waiver. That’s the interesting thing. Because they made it sound like we just kept denying it, and the truth is we had almost no formal asks,” Demsey said.